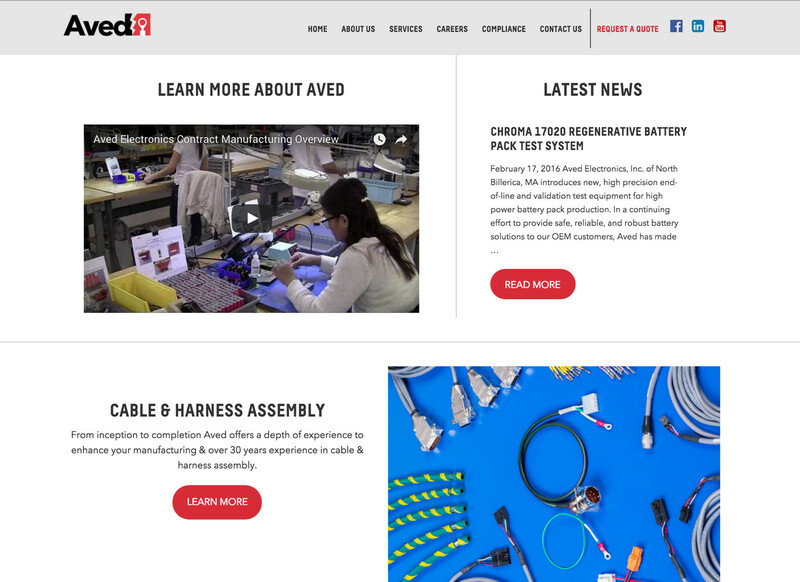 A new, updated website that describes their capabilities for designing and manufacturing cables, harnesses, battery packs and electro-mechanical box build for delivering products that are ready for final assembly has been introduced by Aved Electronics, Inc. of North Billerica, Massachusetts. The Aved Electronics Website is organized by their major capabilities to let the audience rapidly learn about Cable & Harness Assembly, Battery Pack Design & Manufacturing, Electro-Mechanical Assembly and Box Build, and a full range of other Design Dervices. The firm is ISO 9001 certified, ITAR registered, and a Veteran owned and operated small business founded in 1979. Featuring a video that provides an overview of their contract manufacturing services, the Aved Electronics Website describes how they collaborate with customers to optimize manufacturability, component selection and sourcing, documentation review and development, prototyping, and custom inventory management. A company background and compliance information is included. The Aved Electronics Website is www.aved.com and lets users request a quote for specific services.